These days if Donald Trump has a tremor, the GOP dives under a desk. 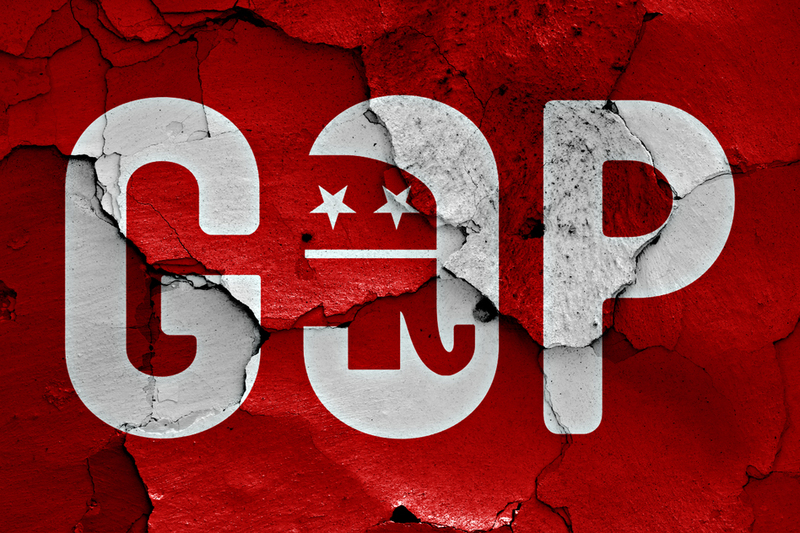 The relationship between Republicans and the presumptive nominee and de facto head of the Republican party is being strained to the breaking point. The very last thing Trump needed was any type of discord in his own campaign team which, of course, means that’s exactly what’s happening. The latest disruption in the Trump campaign force comes at the end of a rocky week that saw Trump and establishment Republicans stop just short of coming to blows with one another. This week starts with Trump firing long time campaign manager, Corey Lewandowski. Sources inside the campaign describe the atmosphere as “bedlam” and the parting could not have come at a worse time. When the first rumblings of a delegate revolt at the convention first stirred it sounded a little like sour grapes from the very fringe of the party. Prior to last week it appeared that the GOP and its presumptive nominee were going to mend fences, but that quickly fell apart and more delegates jumped ship to join a plan to deny Trump a first ballot win at the convention. Both the Republican National Committee and Trump dismissed the delegate’s efforts. No one, particularly Mr. Trump, should be too quick to dismiss such opposition. That is, in point of fact, exactly why we have the delegate system in place. It’s meant to be a buffer against a flawed candidate getting put directly on the ticket by popular vote. Some delegates openly complain that Mr. Trump doesn’t support the party platform and don’t think he can win, the latter being the most persuasive with the GOP rank and file. In the midst of the chaos in the Trump campaign comes news that GOP donors are becoming increasingly nervous, not just about Trump but the potential effect on down-ticket races. The internal problems in the Trump campaign only complicate relationships the RNC has with donors and everyone on the Republican side of the aisle are sweating the possibility of a rout by the Democrats. Though the GOP should remain relatively confident in keeping control of the House, Hillary Clinton appointing Barack Obama or Elizabeth Warren to the Supreme Court, with the backing of a Senate controlled by Democrats, is the stuff of GOP nightmares. Early on after Trump became the presumptive nominee, Michael Steel, former head of the RNC appearing on MSNBC, encouraged Republicans to talk to Trump and reminded them that he’s a businessman and will make a deal. Given the current chaos on Trump’s staff, the lack of a national ground game, infighting among delegates and nervous donors, Steel’s advice now seems almost clairvoyant. Republicans would do well to try and help Trump and work with him rather than attempt a coup at the convention. Donald Trump supporters would go ballistic and the GOP would fracture. Any poker player will tell you that bluffing with a bad hand is better than throwing in your cards and asking for a new deal. Right now the only thing keeping Republicans in the race are Hillary Clinton’s massive negatives among voters, including many Democrats. The risk for Republicans is that Clinton can find ways to raise her favorability ratings and make peace with Bernie Sanders supporters, many of whom lean independent. If Clinton can do that and Republicans continue to be a parade of dysfunction, then the nightmare scenario could become a very haunting reality.